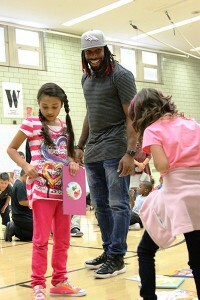 When David Bruton has an off-day, you may find him at local schools, talking to kids about Fuel Up to Play 60 with Western Dairy, as he did recently at Englewood Middle School, or helping low-income children become strong readers by providing books to underfunded schools, libraries and classrooms in schools like Greenlee Elementary. His organization, Bruton’s Books, partners with Mile High United Way to help get books into the hands of young readers. Over the summer, Bruton’s Books collected over 900 books through the Notre Dame Club of Denver, Reverb Church and at the inaugural Bike for Books Bike Ride. 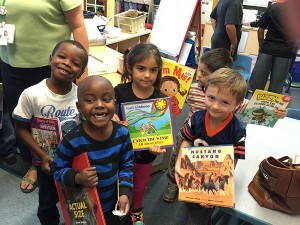 The books were sorted by Mile High United Way’s Reading Corps tutors and boxed for each classroom. Then, it was time to share. 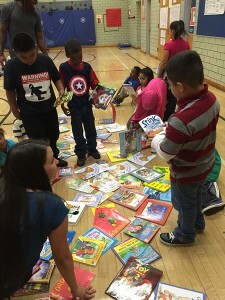 The books were spread out on the floor and the kids were instructed to pick three. David got down on his hands and knees to help the kids with their choices, enjoying every minute of their excitement to read their very own books. Then, he visited two more grades, including the little ones in Early Learning who heard David read a rousing version of Pete the Cat complete with dinosaur roars. Three weeks later, David stopped by the Cope Branch of the Boys and Girls Club in Denver to reward some of the same kids for their hard work in their after-school reading program. Their award: free bikes. The 12 kids from Greenlee Elementary who arrived by bus at the Club tumbled through the door and lit up when they saw their guest. David Bruton wouldn’t want it any other way.